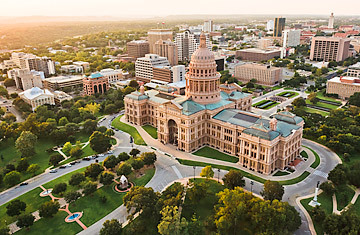 Overview of the State Capitol Building in Austin, Texas. The definition of brave in today's economy might be an Austin retail start-up dubbed TreeHouse. Occupying a re-purposed Borders bookstore, the sustainable home improvement company  sort of a green Home Depot  sits in an old strip shopping mall in a city that saw the birth of one of the most successful ventures in American retail history. Perhaps the most well-known Austin retail success story was launched in a repurposed nightclub space in 1980 when the first postage stamp sized Whole Foods opened. Now that company's "global world headquarters" is located a few blocks south of the original just west of downtown, and is home to a grand food emporium and corporate offices where some 180 stores on three continents are managed. The founders of TreeHouse hope to emulate the Whole Foods model in both vision and growth. They see Austin as a "bridge community," says co-founder and TreeHouse President Paul Yanosy, a place where investment meets ideas and practicality mixes with idealism. Out front, the store features rainwater barrels and xeriscape plants, while inside bamboo flooring tiles and eco-friendly paints fill the shelves. Three years ago, the TreeHouse team embarked on an effort to take sustainable building from the fringe to the mainstream. They chose Austin for a variety of reasons: some of the co-founders were from the area; Austin was an early center of the sustainable movement; there was an investor pool in the city; and the Austin economy was "doing fairly well." The city also had two sorts of potential consumers  people who were concerned with "green issues" and residents who were looking to address economic issues like big electric bills and water restriction prompted by recent droughts. Despite a rich investment pool in Austin, finding backing for a retail proposition was a challenge, Yanosy said, and proved more difficult than gathering financial support for a tech venture. 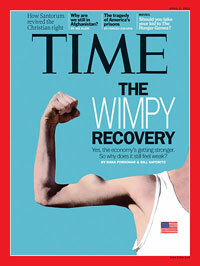 But today's economic challenges, he says, "forces discipline and you have to think more creatively." At 38, Yanosy had left behind a job at a San Francisco law firm, cashing in his 401K to embark on the TreeHouse project. He and his fellow co-founders "felt the time was right" for a sustainable home improvement store and they committed to the long haul. He admits that the endeavor requires constant adjustments like tweaking inventory and staying atop of every shift in the marketplace. "Our job is to get ready, be aware, so that that when the wind picks up, our sails are trimmed and we are ready," Yanosy says. Another attraction for TreeHouse was Austin's rich vein of potential employees who bring enriching experience to the task  the city's vaunted creative life attracts a pool of workers over-qualified for jobs. "A place like Austin is a great place for new ideas," Yanosy says. "It's a fun place to start a business." The city is small enough to allow for interaction between various creative sectors, tech, music, architecture. But while the Austin lifestyle and cultural mix is much admired, it is the fundamentals of doing business in Texas that attracts new startups like the TreeHouse, Yanosy says.